When people ask me how many pets I have, my response is a quick “Four cats and two guinea pigs.” After getting the Are-You-A-Crazy-Cat-Lady look, the conversation continues on to either cute things the cats do (if talking to a fellow cat lover) or on to other topics (if talking to a normal person). But in the back of my mind I’m always cursing myself for forgetting to mention my thousands of other pets: my bees. Except for a couple days when the rain gods reminded us that we do indeed live in the Northwest, the weather over the past week has been amazingly warm and sunny here in Portland. 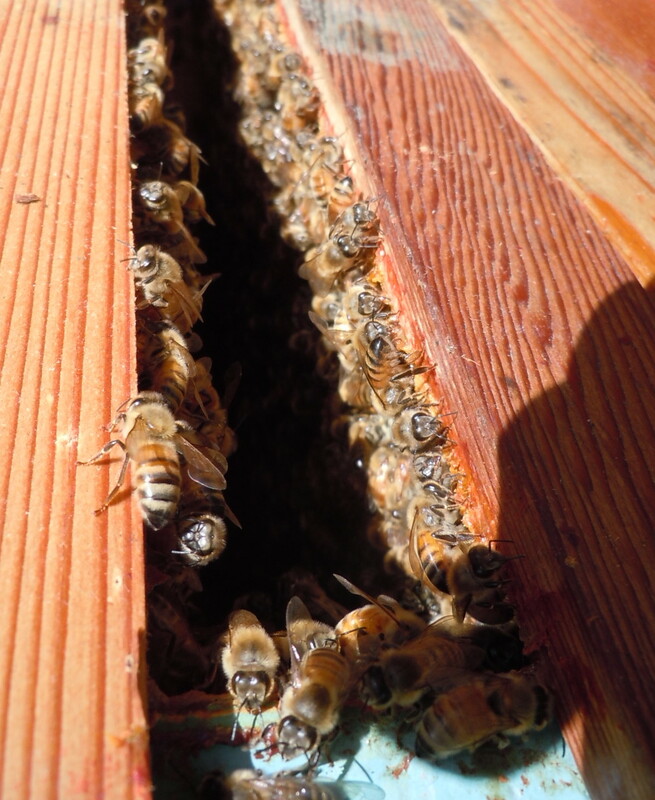 This meant, in addition to the usual garden chores, it was time to take a peek into my beehive and see what the ladies were up to. For those of you who don’t keep a running tally of my life, I’ve had bees for a little over three years now. 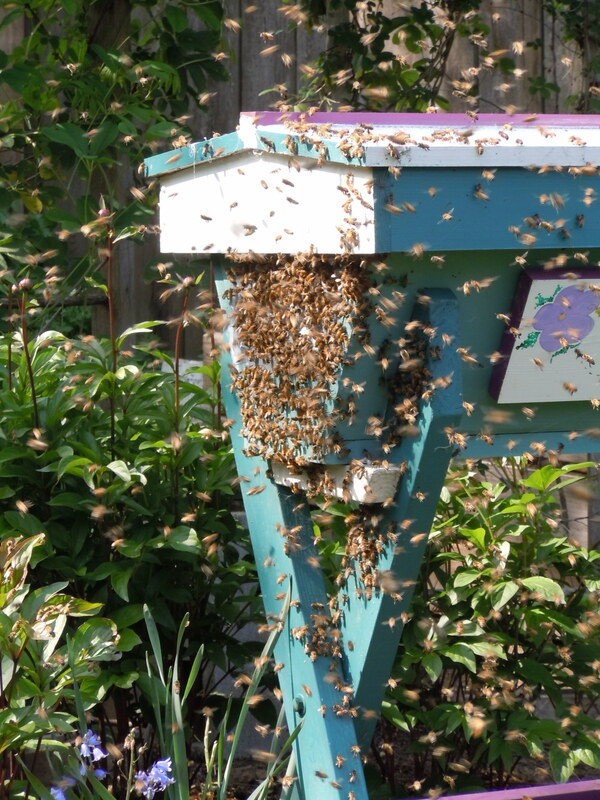 My first swarm of girls showed up while I was away on vacation a few springs ago and were quite the little honey makers until they abandoned me in early spring of last year. Luckily, Portland is a prime spot for real estate even if you’re a bee and a new swarm showed up only a couple months later. Bees are terrible about queuing up. Last year’s unexpected arrival of the new bees. Now, just because I keep bees, does not mean I am in any way brave. After all, I’m opening a hive of thousands of stinging insects. Even though I’ve only been stung four times by my bees, the potential for a rather painful death does bring a bit of an adrenaline rush with every hive inspection. This reasonable fear is why I like to wait until the weather is super perfect to check my bees. I know some people will pop open their hive in cool weather, windy weather, or when certain planets aren’t aligned properly (gasp!). 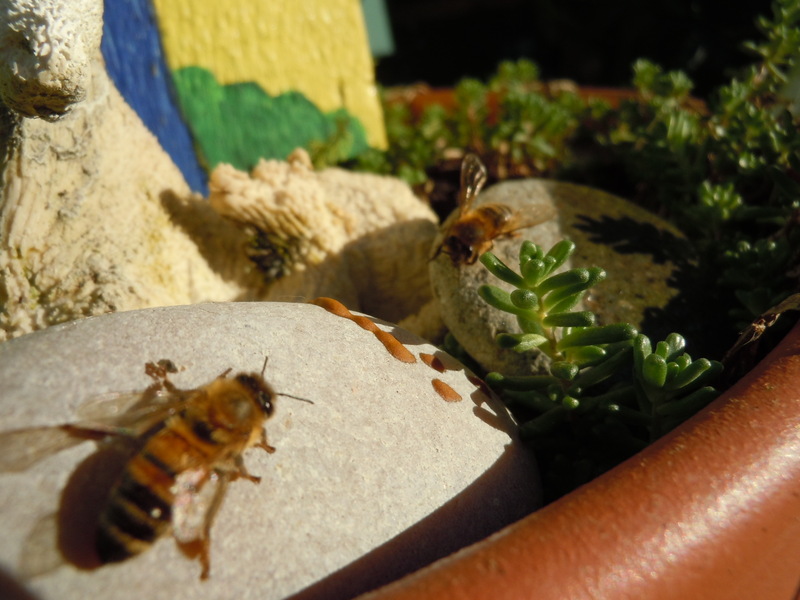 I however like to wait until the temps are at least in the high 60s (19 Celsius or more), there’s no wind, and there is oodles of sun encouraging the majority of the ladies to be out foraging for yummy pollen and nectar. So, when the weather warmed last week, that meant it was time to don the ever-so stylish bee jacket and pop in to say hello to the ladies. 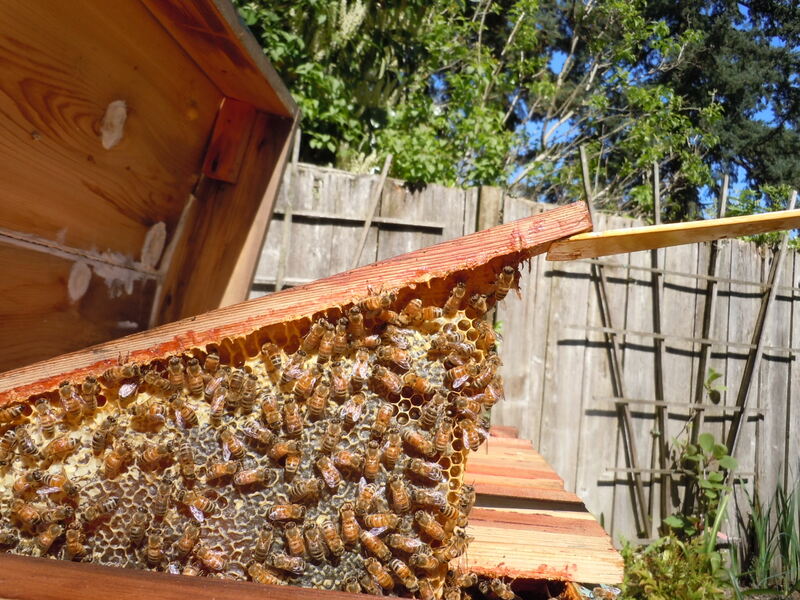 I have a top bar hive, which is sort of like a xylophone with bars running across. 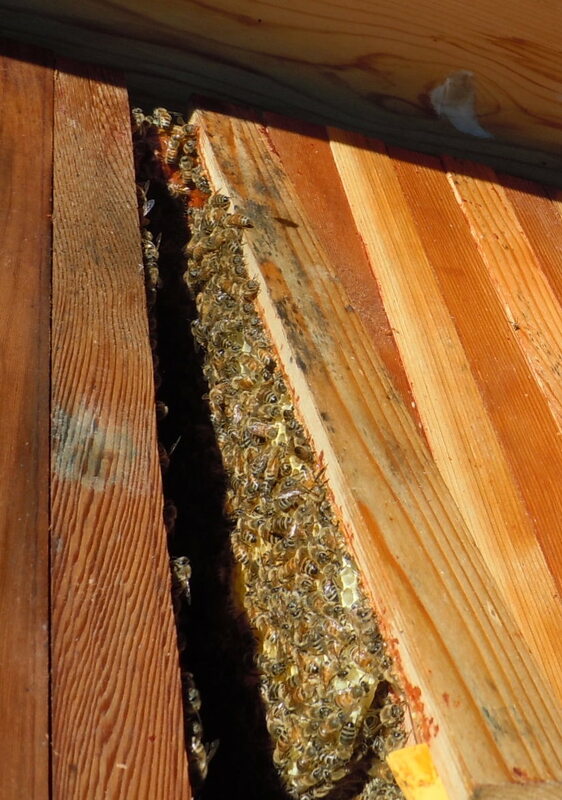 The bees then build comb that hangs down from the bars. 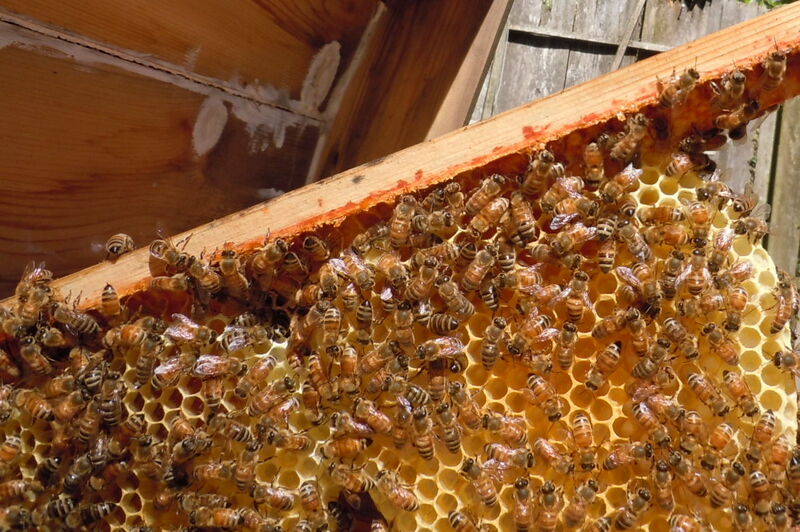 And let me just say, pulling up that first bar to make room to work in the hive, is daunting. Will they come out on the attack? Will I run away screaming? How much of a laugh will the neighbors get as I flail my arms in panic? Only one way to find out. Oh my, that’s a lot of bees. The ladies all look happy and healthy. No signs of mites or disease (yay). Everyone was super mellow and they still have plenty of honey left over from the stores they set aside to survive last winter. I didn’t take any honey last week (after all, it would be a bit rude to pop in for the first time and then start raiding someone’s pantry), but I do have my eye on Bar Number 22* that looks loaded up with the sweet stuff. This means I need to conjure up another dose of bravery to steal this comb from them sometime this week while the weather is still fine. Wish me luck!! What do you think? Does getting up close and personal with thousands of stinging lady bees sound like a great pastime or would you rather leave the honey collecting to braver (crazier) sorts of people? * I numbered my bars back in the early days when I thought I would be organized – that organization lasted about a month. Next Post I’ve Been Framed! My honey addiction must be more powerful than yours! Thanks for buzzing by! My grandfather was a beekeeper and lived next door when I was growing up. I was terrified of his hives. An irrational fear, I know now. He always had great honey and took his occasional stings in stride. I’ve read the bee stings are actually good for you. He lived to be 100 so maybe there’s truth tot that. I do love just hanging out by the hive watching them zipping in and out (and hoping they haven’t been off to any yards whose owners spray nasty chemicals all over).